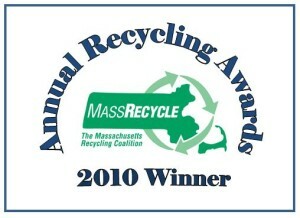 "MassRecycle is happy to present the Recycling Business Award to Pedal People, an eight year old worker-owned recycling and waste hauling business. Pedal People's twelve cyclists use trailers propelled by bicycles providing curbside pickup of trash, recycling, and compost to 480 households, 37 businesses and 80 public barrels within the city of Northampton, MA. In 2007 Pedal People began offering food waste collection to existing customers at no additional cost, collecting an estimated 4,700 cubic feet of food waste used for local compost. In 2009 Pedal People collected an estimated 1,600 cu ft of food waste, 31,000 cu ft of paper, 27,000 cu ft of containers for recycling and 47,000 cu ft of trash. Pedal People discourage waste through a volume based pricing structure. They encourage recycling and waste reduction through personal conversations with their customers. They deliver diapers for a cloth diaper service, and offer a discounted month of cloth diaper service to existing customers using disposables."